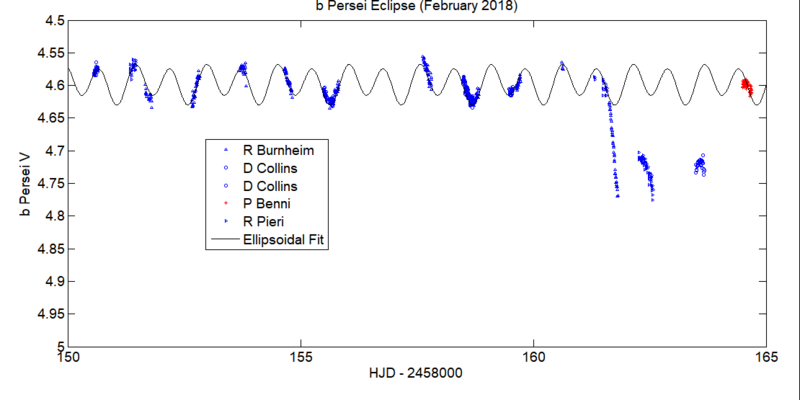 What I wish to share is that the processed data (aligning all out-of-eclipse observations to the ellipsoidal curve), doing some more time-bin averaging where needed, has not "bottomed-out" in recording the deeper eclipse depths of March 2016 previous primary eclipse. Unfortunately the lowest brightness of the eclipse came at the "white-out" times for Europeans and N. Americans. Observers' data are of very fine quality! Many thanks again! Hi, I have recently uploaded my last observations, all of them out of eclipse. A pity the bad weather: only a good night during all the campaign. I hope during the next eclipse, weather will be better. At least the November eclipse will be very well placed in the sky, with Perseus visible almost all night. All my observations of b Per from the Ferbruary are in AAVSO db. I have just reported to AAVSO database all my DSLR observations from the last eclipse of b Persei. I made observations every night from 5th to 13th of February. After completely cloudy winter, it was unusual a week-long window of clear sky - the the longest one in my history of b Per eclipse catching (... starting from the first in 2013). Unfortunately the weather spoiled from 14th of February. Some people in Poland were interested in observing the last eclipse, but they had clouds instead of clear sky (... I was lucky :) ). I will promote the idea of observations of this facinating object during eclipse in November 2018 and the next ones (i.e. ~1 week before and after the date of predicted eclipse). I finally reduced my last set of out-of-eclipse frames, so I've now reported everything I've got on b Per for the Feb 2018 campaign. I'm a proponent of "open data", so if someone would like to have some of my raw images from a particular obs period, I'll be happy to make them available. 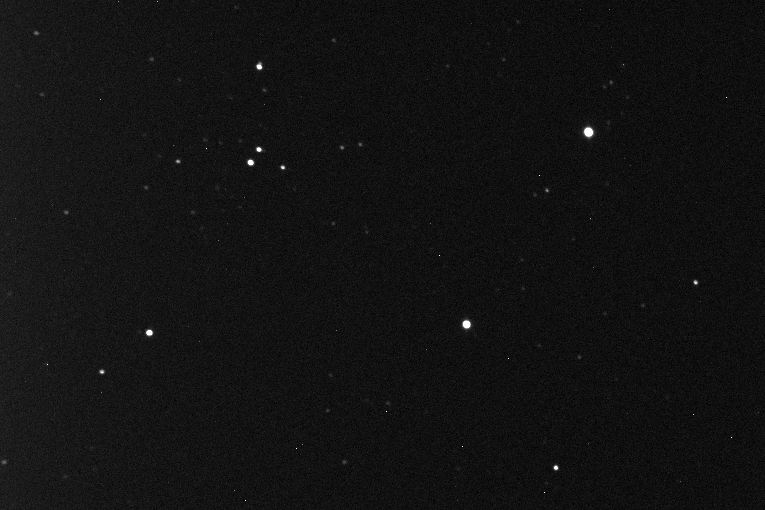 I found, that some observers make use of Iris program for DSLR photometry of b Persei. I attached a simple spreadsheet, which I applied for processing instrumental magnitudes ( ... obtained from automatic photometry in Iris) to standardized differential DSLR photometry. Instrumental brightness only 3 stars: comp (HIP 20156), var (b Per) and check (HIP 20370) is needed for the spreadsheet. It also prepares data for AAVSO reporting. It supports my approach, where a single DSLR observation reported to AAVSO is a mean value calculated from (... usually) five individual standardized measurements and the error is calculated as a standard deviation of the mean value. This is because I made a long timeseries 30sec exposures (lens 200mm / F4 + Canon 400D on EQ3-2 with RA drive --> image of b Per needs to be defocussed up to 18 pix radius). 1. Fill coordinates of the observatory and time zone correction on sheet "Air_masses" (3 yellow fields). 2. 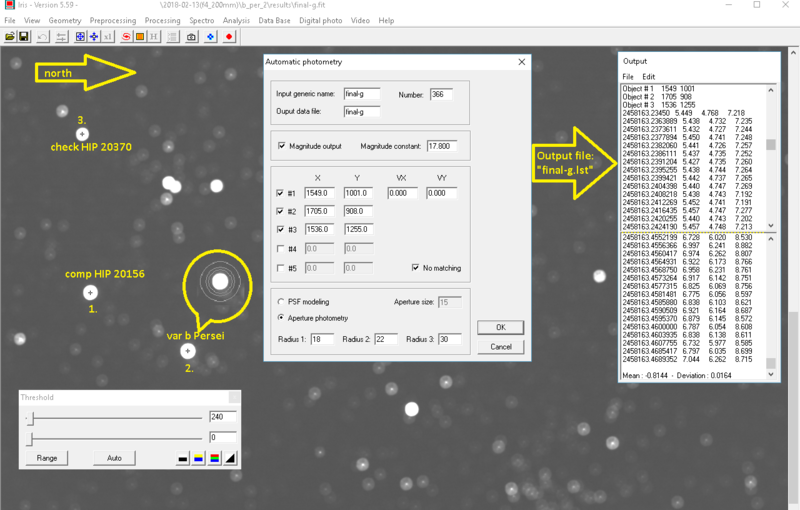 After selecting 3 stars (comp, var, check -> menu IRIS-> Analysis -> Select object) make automatic photometry in IRIS. In an expamle shown on a picture IrisAutomaticPhotometry.png, the automatic photometry was made on a series of images "final_g1.fit" ... "final_g366.fit" and the result was saved in the text file named "final-g.lst". 3. Copy and paste contents of the text file "final-g.lst" to green area in the sheet "Photometry_TG_or_V" (before paste it may be necessary to convert groups of 5/4/3 space chars in "final-g.lst" into field separator i.e. ";" and dots into commas using simple editor like notepad ("find & change")). 4. If necessary, make correction of mean values in the sheet "Photometry_TG_or_V" (rectangle K36:M590). a) For instance, the attached spreadsheet contains real instrumental magnitudes TG, TB i TR of b Per, comp and check star without any modifications. It is a must to correct mean values in some cell, because there were long gaps in observations (see column "Remarks" : raw 204/205--> 30 min interval, raw 364/385 --> 20 min break, ...). b) It is better not to delete outlier raws in the spreadsheet, because area of data (green/blue/red area) is next to the area of mean values calculation. It is better to modify area where mean values are calculated (i.e. rectangle K36:M590), by changing the cell's range taken to the mean. In an ideal case nothing is to be done. c) Before every usage of the sheet, it is necessary to clear green area from the numbers (instrumental mags, JD) and text (remarks). It is also usefull to adjust a number/range of observations by editing each figure. 5. Copy area of observations in the AAVSO format from the spreadsheet (raws > ~600) to the text file. In order to prepare a file to upload to AAVSO database, after pasting data to text file, it may be necessary (in the same way as at point 3) to convert in the text file commas to dots and TABS to field separator "|". Using the spreadsheet it is possible to report observations of b Per in all DSLR band (i.e. TG, TB, TR), as it doesn't cost too much more work than in one colour TG. In the spredsheet, 3 sheets are prepared for three DSLR bands: "Photometry_TG_or_V", "Photometry_TB" and "Photometry_TR". In principle it is possible transform TG brighness of b Per to Johnson-V using the spreadsheet, but I didn't do it (Eclipses in b Per system seems nearly grey. I found "DSLR" colour index TB-TG only ~0,01 mag redder on 12th of February 2018). Don will match the systematic differences between the observers on data outside the eclipse. I hope the spreadsheet will be usefull for those, who use Iris for DLSR photometry of b Per. Thanks for the spreadsheet template for DSLR users who use IRIS photometry. Although I don't use Iris, I'm sure your hard work will pay off for some. Also thanks for your good data! I took a series of 50 images before the eclipse (3 Feb 2018, 9:30 to 10:00) but my data is all over the place. I was wondering if you could send me a few of your images so I could compare them with mine? They are from Feb 12th. Let me know if you would prefer the raw images (plus darks and flat I guess) separately. The obs-time and some other fields in the fits header are wrong, btw, don't rely on them. Each Fits file is the result from stacking 25 images (just from green pixels!!!!) with 2.5 sec exposure each. North is up (not exactly but roughly) and East is left. Here is one of my images taken with a CCD and 400 mm Focal Length telescope (80 mm diameter stopped down to 43 mm). The FOV of this image is about 1 degree. North is up, East is Left. b Persei is the brightest star in the field, the bright star in upper right. Thanks for the link to your images. I'll check them out. You say they are 25 images of 2.5 seconds each stacked. how long beween images? I use APT to plate solve and get b Per within 50 pixels of center and then take 10 second exposures at ISO 100, one minute apart. I guess that is too long? I was trying to avoid scintalltion, but I think I saturated the image. I took one image every 7 seconds. I don't think the cadence matters that much, the exposure time of 10 seconds might be a bit high depending on the optics you are using. If your focal length is short enough to have some brighter stars in the field, you might want to check whether the top pixel ADU value for those brighter stars would be about the same as that for bPer , that would hint to saturation. You could also share a raw or calibrated image of yours here and we would take a look. I've finally uploaded my results from the 9th to 15th Feb. It was my first go at long time series, up until now I've been cutting my teeth on single measurements of long period variables. The resulting mountains of images was a complete shock. I might have given up had it not been for RYBI's template spreadsheet (many thanks, Richard). As I had a few quality problems (caused by the wind, I think), and had to bin numerous images, I just added a few cells to account for the different number of images in each group. My scatter is larger than others', but I hope they can be of some use. Thanks for the chance to take part in an interesting project and I look forward to the next opportunity with smaller uncertainties. Its been really cloudy here in So Cal, so I havn't done any more imaging of b Per. Here are two of my unprocessed raw CR2 images from before the eclipse. Indeed, bPer saturated the pixels quite a bit. This means that mesurements from images taken with this setup/camera settings should not be put into the AAVSO database (and should be removed if they are already there). 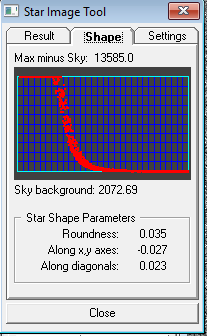 Here is a screenshot of the "Star Image Tool" in AIP4WIN that displays the pixel values (I took the green channels only) on the y-axis depending on the distance in pixels from the center of the blob of pixels that represent bPer (on x axis). As you can see, the pixel values form a plateau near the center: this is a smoking gun for saturation, the curve should look like a bell shaped curve, without this plateau. An 8" scope is quite an instrument to point at this bright objects, it just collects too many photons per second to allow a 10 second exposure without totally overwhelming your camera's capability to "count" those photons. You would have to defocus more and/or take shorter exposures and/or use smaller aperture optics to avoid this. a) saturate the sensor itself. Each pixel can record only a finite number of photons hitting it in a single exposure, and this number is actually relatively small: depending on the sensor several 10s of thousands of photons (actually the electrons that are freed by the photons hitting the pixel), to 100s of thousands. If more photons hit the pixel, they do not get measured. This happens independent of the ISO setting. b) after the exposure is finished, the electrons stored in the pixels are "read-out", by amplifying the current that results in lettting the electrons move back to where they came from (so to speak) and then measuring the current with an Analogue-to-digital-converter (ADC), The amplification is selected via the ISO setting. Now the ADC has a finite resoulution, in modern DSLRs they typically use 14 bits, so they digitize the analogue flow to numbers in the range 0...16383. But if you set the amplification (that is ISO setting) too high, this range is not sufficant and you hit the max value of the ADC for pixels even if they don't have the max pixel value. This results in the same "plateau" effect in plots like the one above, but at levels that are a power of two minus one (16383 for 14 bit ADCs) in the raw image. Note that in calibrated images (aver bias/dark/flatfame corrections), that level will no longer be 16383 because (among other things) a constant value like 2048 for the bias has already been subtracted. The image is then still saturated and, unfortunately, "junk", of course. Hope this helps. Sorry for the bad news. You could check whether there are other variable stars in that field that are much fainter than bPer, tho, and measure them. I am not planning on submitting any data to AAVSO until I figure all this out. Thanks for all that info. I have reread your post several times, trying to assimilate it all. When the weather clears, I will try some more experiments until I can get some decent images. You're welcome. Don't hesitate to ask questions if something was unclear. I guess the gist of my rant above was: if you make your exposures shorter and/or defocus more (to spread the same light across more pixels) and/or use a telescope or telephoto lens with a smaller aperture, you'll be able to avoid saturation for objects this bright, and all will be fine.